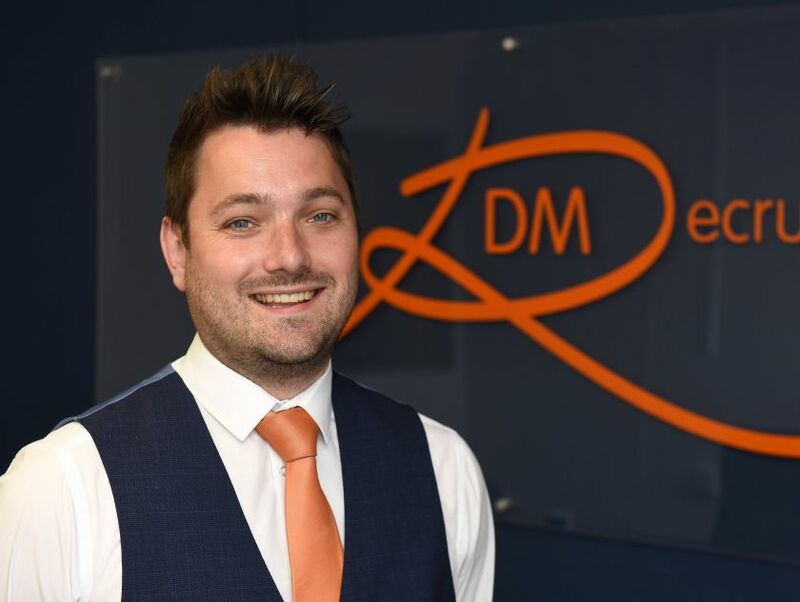 Stuart Danks is the owner/director of DM Recruitment which specialises in temporary and permanent industrial recruitment. The company was launched in May 2015. EXPLAIN A TYPICAL WEEK IN YOUR WORKING LIFE: Meetings with staff, running the financial side of the business, spending time in our three branches and future planning (growth and training). WHAT IS THE BIGGEST CHALLENGE FACING YOUR INDUSTRY RIGHT NOW? The skills gap. The gap between the skills that employers want and those that are available is always a challenge, but one that we focus on and aim to meet head on. AND WHAT ARE THE BIG OPPORTUNITIES? The biggest opportunity for us this year is expanding the business into the food sector due to staff shortages for other agencies. HOW DO YOU GET THE BEST OUT OF YOUR STAFF? We want our staff to be happy and comfortable in their job roles and we have incentives and ensure we have fun days and nights out to boost morale. WHAT WAS YOUR LAST MEETING ABOUT, HOW LONG DID IT LAST, AND WAS IT PRODUCTIVE? Our last meeting was about our quarter four strategy for growth and the DM Recruitment staff training needs. It lasted around three hours and was very productive - identifying relevant staff training and having a strategy for the future means that we are always at the top of our game and meeting the needs of our clients. HOW MANY EMAILS DO YOU GET IN A DAY, AND HOW MUCH TIME DO YOU HAVE TO READ THEM? Far too many, I would say 100+, but I always make time to read them because when it comes to recruitment communication is extremely important. DO YOU ANSWER WORK CALLS OR EMAILS AT HOME? WHAT’S THE RIGHT WORK-LIFE BALANCE? What work life balance? I work all the time as our business is 24hrs - as the industrial industry is. Emails and calls come in all the time - although I am probably OK between 12am and 5am. HOW DO YOU HOPE YOUR COLLEAGUES WOULD DESCRIBE YOU? Wouldn’t like to say. But hopefully passionate, hard working and committed. BREXIT – WHAT’S YOUR VIEW OF WHAT IT’S ALL GOING TO MEAN? It's change, people don’t like change so try to avoid it. I believe if you aim to utilise the positives then they will always out-way the negatives as long as you work hard and smart. HIGHLIGHTS OR LOWLIGHTS OF YOUR CAREER SO FAR? Opening my own company and seeing it grow at a rapid speed is a highlight. Lows would be hearing people being unhappy or not feeling they have had the best possible service - there are always areas to improve. PET HATES? People saying it isn’t their job. IF YOU COULD GO BACK AND GIVE YOUR YOUNGER SELF SOME WISE ADVICE, WHAT WOULD IT BE? Learn more! Don't waste great opportunities! HOW DO YOU RELAX AWAY FROM WORK? Spend time with my family. WHAT DO YOU BELIEVE IS SPECIAL ABOUT THE SHROPSHIRE BUSINESS COMMUNITY? We are a small community who all try to help each other and respect each other’s success. TELL US SOMETHING ABOUT YOU THAT MOST PEOPLE PROBABLY WOULDN’T KNOW: I can play the Violin to a decent standard. YOU CAN TAKE ONE BOOK, ONE FILM AND ONE CD ONTO A DESERT ISLAND – WHAT WOULD THEY BE? Dan Brown Da Vinci Code; Top Gun; 90s mix! WHAT WOULD YOU COOK FOR THEM…? My famous spicy pasta! !